This started on 11 August as a cut-and-paste of correspondence and links about London riots which have seemed useful. I’ve continued adding more on the bottom end, until today 31st at least. Penny K points to the good material (including this image) on Critical Legal Thinking. Many thanks to the INURA network listserve which has been the best email source. I live on an estate in Battersea which was very quiet Monday evening. The kids (black white and inbetween) had all pissed off up the Junction to nab their trainers. The next morning I went down to clapham juncton for the clean up. Yes, lots of bankers’ mates and Wandsworth Tory shocked middle-classes there but also SW train guards, local shopworkers, black white whatever. And plenty of very aware talk on the street. I said as loudly as i could that the bankers get their bailouts, but who bails out these kids? If looters are scum, then where did they learn their lessons? Banker looters, politicians looting Libya, cops and news corp bribes, if everyone’s on the take, then why is anyone surprised if the kids are on the take? Lots of wandsworth tories looked horribly shocked, but plenty of others said much the same. We were all though shocked by the degree of fracture here. The people sweeping up on the street in the morning have a stake; the people out in the night, burning, do not believe — quite reasonably — they have a stake. something is horribly wrong. This is a very scary version of the world turning upside down, a world of deprived and disaffected youth, normally underground, suddenly surfacing into bourgeois well off consciousness. Not a moment too soon. If this happens before the giant economic crash is underway, then what next? How are we working to create mutually dependent communities, when these kids have been driven over a cliff edge already? But i defend the broomsticks. Broomsticks after all belong to witches, they are womanly and connote neighbourliness, and connection of neighbourhood. The tabloids may try to hijack that into a ‘looters are scum’ message. But the only way to resist a development of vigilante property owning gangs vs feral youth gangs is to support true rooted community linkage on the ground. Perhaps we need to subvert the square broom symbol with proper witches besoms! personally i’m kinda tired of people with no idea about london/the affected areas/etc. giving 2-dimensional, black and white opinions on them. not just here but seemingly everywhere, every list, every tv station, every website! the situation is not the same in tottenham as it is in croydon as it is in barking as it is in birmingham. racism and poverty are there, but in different ways in different neighbourhoods. it is complicated, and not all happy smiley liberation struggle as some want it to be. it’s not all mindless criminality like others want it to be either. more of a messy mix. more political in some places, more zombie-consumerist in others. but, it’s not all so clear cut. so, yeah, everyone wants to explain it, project their world-view onto it. personally i think its more a depressing sign of how deeply fucked england is, but its fucked in a complicated way that doesn’t fit nicely with anyone’s neat theory/explanation. about the events. I find the stories and tweets of the Guardian’s correspondents very helpful, but even they seem to be overcome by the spread of looting and motivations of looters. Yes, this reminds us all of earlier times, going back at least to 1964, 65, and 68, if not to the Detroit riots of the 1940s. There is indeed a long history of unprivileged ethnic minorities, segregated by race and class, rioting against public authorities and looting nearby stores. One of the few serious comparative studies, Janet Abu-Lughod’s Race, Space and Riots in Chicago, New York, and Los Angeles, emphasizes that the crucial difference in the severity of the outbreak is the severity of the police response and the willingness or refusal of elected public authorities to engage in dialogue with community leaders (if not with people on the street). From this point of view the events in Britain don’t look good. “white” Dutch people. The high-rise concentration of nonwhite Dutch in one public housing project in the eastern part of the city is an exception, and an error that the city government is trying to correct by selective demolition and new construction of low-rise, owner-occupied apartments. Rotterdam, the second-largest city in the Netherlands, has a far greater non-white population but also has, I believe, more non-whites in local government. Nonetheless like all European (and other) cities Rotterdam is struggling with how to express this diversity in public culture. I was puzzled however by a researcher who stated that few “immigrants” work as school teachers in the Netherlands. In big U.S. cities employment as a public school teacher, as well as in government bureaucracies and the civil service, has historically been a path to middle class status. There are many “nonwhite” Dutch working in other government jobs, from offices to sanitation crews–and unless those jobs have been outsourced to private contractors I assume that the school system is an exception? I was both puzzled and amused by efforts in the past few years by the Amsterdam city government and the formerly nonprofit organizations that own social housing to “diversify” non-Dutch ethnic concentrations by helping “cultural” businesses to move into commercial space. Can this be a negative effect of “creative city” policy? Finally, since I am now collaborating with others in a research project focusing on local shopping streets in Amsterdam, New York, and four other global cities, I am saddened and interested by the concentration of looting on nearby, and relatively non-securitized shopping streets, often the province of small, hardworking immigrant entrepreneurs. But I also note the spread of consumer society–both geographically and aspirationally–to looting of large chain stores like Foot Locker and H&M in London neighborhoods, to semi-suburban shopping centers like Salford near Manchester, and even to Oxford Street in central London and central Manchester and Birmingham. According to the Guardian, there are at least rumors that some of the looting has been coordinated by social media, giving rise to premeditated action. Each form of collective behavior builds on previous events and takes advantage of contemporary structures. Deprivation seeks expression, especially when provoked by police action–an arrest, a shooting–that community residents consider illegitimate and unjust. both minority and white youth-often gathered in integrated groups. British Afro-Caribbeans are much more integrated-in terms of residence, partnering, and social life-with white Britons than are British Asians (Indians, Pakistanis, Bangladeshis). Furthermore, the little that we’ve heard directly from rioters suggest that socioeconomic disadvantage, exacerbated by dramatic cuts in social spending by the Conservative government, is fueling their anger. Still, aside from socioeconomic conditions, repeated police encounters like Duggan’s do anger young men. But, young white working class men also experience frequent stop and searches in Britain. In my research with teens attending diverse secondary schools I found that both Afro-Caribbean and white working class young men in London were frequently stopped by police. These encounters usually happened on the student’s public housing complex, and students usually understood that their style-especially hoodies-had something to do with police perceptions. This finding contrasted with what I heard in New York, where black young men were overwhelmingly more likely to have been stopped by the police than their white and Asian peers attending the same high school. So the intersection of gender, race, and class operates very differently in urban Britain than it does in urban America. Friends, Would anyone care to comment on: 1) comparison between U.S. urban “riots” and present UK; 2) role of segregation/ghettoization in U.K. ? (1) can’t comment on comparison of US and English (it’s not scotland or wales, just England) urban riots. See previous email [below] about Celine’s broadcast: that may help. (2) I’m not really expert on all this but I think critical urban researchers in UK tend to consider that “ghetto formation” so widely documented in USA is not matched exactly in UK, nor of course do we have a history of black/white segregation at all similar in time and space to the USA history. Our forebears’ exploitation of slavery was at arm’s length. The thrust of policy from our fairly extreme right coalition government is rapidly accelerating the downward pressure on wages, salaries and the living conditions of much of the population, to the benefit of a small rich minority and – even with a compliant / reactionary mass media – growing parts of the population may be coming to see this. We hope so anyway. The intersection of ethnicity with class is very complicated and I hope other people in the INURA list especially Sonia and Penny can contribute expert knowledge and better perspectives about it. It is very clear that some recently arrived (first generation) migrants have a very oppressed experience both in terms of income and civil rights (to work, to civic positions like voting rights, to welfare rights); so also do some second and third generation descendants of migrants, especially some from Bangladesh and Caribbean. Some of this is discrimination in hiring, promotion, education and other structures. Some of it is transmitted from generation to generation reinforced by our very unequal education system (and there is an urban segregation aspect to that, and a property market aspect whereby purchasing power in the housing market regulates access to good education). Poor white populations get screwed too. In London we have tended not always to have the coarse-grain segregation of class or ethnicity which (in our stereotypes) we associate with US cities. This is because we have had a history of extensive social housing, even in or near quite rich areas, which damps down the market pressures towards homogenisation of neighbourhoods. (This now under intense threat from the new London Plan and from government cuts to Housing Benefit levels and social housing targets. http://justspace2010.wordpress.com The forces of gentrification act very powerfully in most poor areas.) My own subjective sense is that a substantial proportion of Londoners think of their class position as shared with people of assorted ethnicities. Other cities very different, I think, and some have much coarser-grained segregation where the industrial / housing history is different. One final point: looters attack small shops as well as large corporates. Is this significant? Basically I have no idea and doubt whether much can be deduced from it. I hope this response will generate others and help build up some shared understanding. Just a couple of additional comments on the U.S. Situation – with no presumption that it is pertinent to explanations of recent events in British cities. Unfortunately, the stereotype of rigid and extensive racial segregation in medium and large U.S. cities, and in many small ones, still holds true today – that is, the stereotype was and is accurate. Although in the last 20 or 30 years middle class African Americans have suburbanized very extensively, for the most part even these people live in quite highly segregated neighborhoods, and in good part these neighborhoods are either physical extensions of Black city neighborhoods (but across municipal borders) or they are long-standing suburban ghettos that have expanded in population. The best measure of the true nature of residential segregation in the U.S. is public school segregation, which is remarkably high. (Public schools enroll nearly 90% of school children.) Segregation has been diminishing for the Black population, but very slowly, and rising for the Latino population. Most White kids go to schools where the Black population is vanishingly small. Most Black kids attend schools with majority minority populations, usually with mostly other Black kids. Maybe this wouldn’t be so bad (it IS bad), but most city schools are deeply troubled, with less experienced teachers, overcrowded classrooms, poorer facilities, and larger burdens in their kids with problems of poverty, poor nutrition, and English as a new language. Of note, no other populations group (e.g., various “ethnic Americans,” including East Asians, South Asians, but also Italian Americans, Irish, etc) has ever suffered even remotely the same levels of segregation, and in time their milder levels of segregation have tended to disappear. Latinos are somewhere in between; and limited research (the data are hard to get) shows that dark-skinned Latinos suffer much worse segregation than other Latinos. this is to briefly comment on the urban movements in (north) london that so many of the commentators have discredited as mad underclass consumerism (looting) and miss a clear political message in this (also sennett & sassen). How come that consumerism/ anti-consumerism/ looting is not a political message? (see zygmunt baumann http://www.social-europe.eu/2011/08/the-london-riots-on-consumerism-coming-home-to-roost/) ? why are we struck by broken windows? are we? who are we? i have difficulties by now to sort out, what inurians think ,when passing on a number of links of other commentators in mass media. What is criminal? only last week i was in london with a friend to have my documentary shown at the right to the creative city workshop @ UCL and i was struck by the consumerist city climate and heavy tourist + business traffic in the center, with no place to chill-out for free (and if so, with no place to pee). it was a relief to leave the center, if you knew where you are going and have a clear destination. We went east, north and south. We stayed in peckham after all and experienced somewhat of ordinary, daily life in london (thanks Mark!). On our way to peckham we met John, a 20+ black homeless male, who considered himself a criminal and said he would do anything… but has no perspective whatsoever. We shared a beer on the street and said good buy. the day before, we met Attila, a 30+ white male hungarian, who works as a dishwasher for 5 pound per hour. his rent is 400,- the monthly bus ticket 80,-. he lives in the north and it takes him 1,5 hours to go to work. he left hungary for a perspective, which is not fascist, and seriously tries to save money from what he makes. He was a clever guy, so cynicism was overcoming us. Then we got drunk. We split at sunrise with a hug. These two experiences fit the picture of what i saw on the streets and what is happening now. I was wondering, for how long has this been going on? for how long have people been taking this? hence, a new round of austerity measures is not the reason for these riots, while the old cuts are still developing. it is not very difficult to understand that this social unrest took time to develop, and took a trigger, while people were first kept busy with multiple jobs and only later realized they will not come in reach of the good stuff (iphone etc) soon. what is criminal? I have missed such comments from inurians so far. 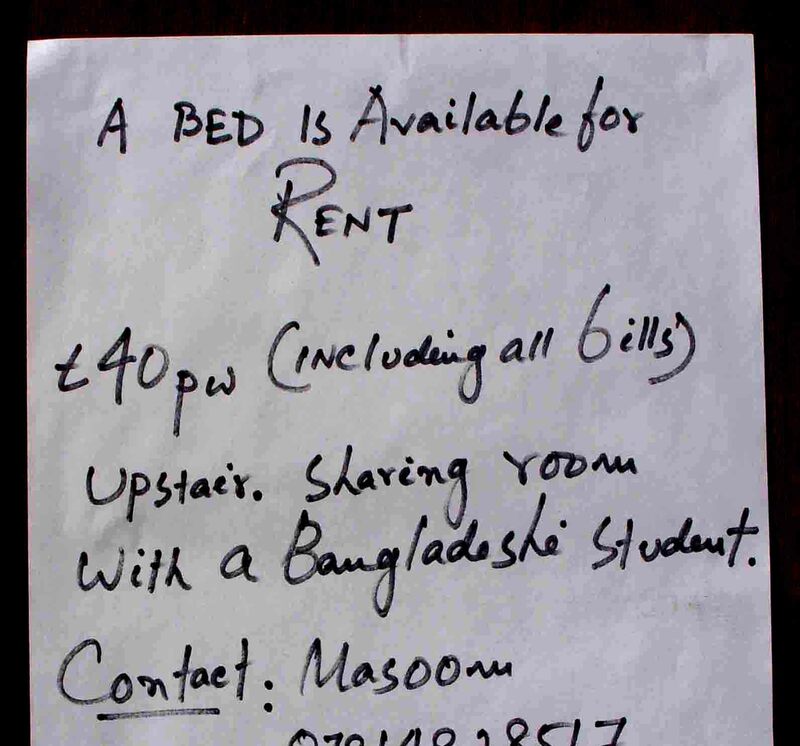 I attach a picture from east London, that shows an ad of a Bangladesh student, who offers to sublet/ share his room for 40 pounds per week. I’ll try and reply as a London INURA man – tho I’m away on holiday and following by mass- and non-mass media just like you – and talking with people including my son who is manager of a vinyl music shop in Islington which has been a scary experience. 1. Current crisis hit jobs in provincial manufacturing centres (and cities like Liverpool with lots of back-office government jobs) first and hardest; London was initially sheltered by massive bailout of banking (one of London’s leading employers) which might otherwise have shed a lot of staff; also by concentration in London of construction activity associated with Olympics and massive infrastructures and continuing work generated by luxury housing production and upgrading which has hardly faltered and by focus on London of the Labour government’s legacy of housing production subsidy. Now London is being hit by job losses including heavy loss in retail and in public services. 2. Lots of services and facilities (including the free places to hang out which you missed) existed until the last year and have now been closing fast including youth clubs and social services, cultural and music projects, training, language courses. 4. Rents have taken a strong upward surge. 5. Public transport fares and energy prices have been escalating. College fees too (and support grants to youth in education ended). Others may be able to offer more or deeper insights. But for me these are the dimensions which have got fairly rapidly worse in the last year or 2 years. One important feature of London, I am sure, is the premium on energy/self-confidence/ ambition as key elements in survival. The economist Ian Gordon has done good work on this in connection with the way people move to London to accellerate their careers through active promotion etc. But I think it applies all through the strata. There is usually work to be found by people who are prepared to work terrible hours, be efficient, be charming, or whatever is required. If you can’t or won’t do that – for whatever reasons – you get trampled. It echoes a bit with Richard Sennett’s work on work, self-respect and self-esteem. It can be a crushing place. PS the ref to broken windows in the sassen/sennett NYT article may echo a phrase used in US literature where it is suggested/argued that, as soon as you begin to get broken windows in a district, then social control / standards of behaviour start to unravel. Ot it may just be a headline writer’s way of describing looted shops. Just a quick announcement about a ‘flash conference’ we are organising in the Centre for Urban Studies at York (UK) on Sept 22 and 23rd on urban unrest in the UK and rest of Europe. No conference fee but delegates will need to cover their own meal and accommodation expenses. A flier [was] attached so do please circulate to anyone who might be interested in giving a paper or attending. Has somebody any thoughty of how the recent urban outbreaks, revolts of the poor might be read in the light of some of Piven and Clowards earlier work? So based on our theoretical works, what effects of urban outbreaks to remodel the “social contract” are to be expected? and same day Roger Keil: A very good question, indeed, Manuel! If I remember correctly, P&C counted on ‘disruptive’ actions in order to shake up the welfare state. Legitimacy of state institutions was challenged in this manner. This ‘strategy’ does not seem to work as well today in our ‘postpolitical’ climate (Swyngedouw, Zizek) where the state claims all legitimacy without any room given for disruption. As we learned today, it is not just rioters who are deligitimized by the state but also individual peaceful activists who are called blackmailers of “an elected government into changing policy” as happened to Anna Hazare who was jailed today by the Indian authorities. Hi i have compiled a few articles of interest from the media and various blogs about the riots. There’s some eye witness reports, and some deeper analysis. It is not coming from one perspective, and it also highlights how papers like the Telegraph can occasionally publish articles that are actually more from a working class perspective than the Guardian and other liberal left newspapers. 18 August Murat Yalcintan in Istanbul put together a TV discussion, with Turkish interpretation, and wrote afterwards: I just wanted to thank you for your contributions to the program. We had Paris, London, Athens and Madrid live connections and me and two other guys tried to comment on your explanations. I think it was good for the audiences. 21 August Mark Barrett sends this link to reflections by Slavoj Zizek in the LRB. Don’t be put off by the misleading title.